Copyright: © 2018 Atia A. This is an open-access article distributed under the terms of the Creative Commons Attribution License, which permits unrestricted use, distribution, and reproduction in any medium, provided the original author and source are credited. Background: Irrational antibiotic use has led society to antibiotic resistance, a serious health problem worldwide. This study aimed to assess the prevalence of antibiotics self-medication among university medical students in Tripoli city. Methods: a pre-validated questionnaire [Translated to Arabic language] was distributed to 305 students at Tripoli University (Faculty of Medicine Technology) and students were requested to report antibiotic use with or without prescription in the year 2017. The questions enclosed demographic information as well as frequency of antibiotic use, completion of course, status for which it was used and the type of utilized antibiotic. A total of 257 forms were completed and returned (response rate 84.2%). Results: Most of surveyed students were females (243, 94.5%), with average age of 24.8 years (range 18-25). Occurrence of antibiotic use with and without a prescription was high (98.8%). The pharmacy was the main place where the majority obtained antibiotics (82.5%). The course of antibiotic was completed by greater number of respondents with prescription (68.3%). Influenza, upper respiratory tract infection, gastrointestinal disorders, skin conditions and urinary tract infection were the conditions for which antibiotics were used. The most common antibiotics used were co-amoxiclav, amoxicillin, and cefixime. The basis for using antibiotics without a prescription includes doctor advice on last visit (36.5%), previous experience (27.9%), pharmacist advice (23.3%), and advice of relative (12.1%). Discussion: The findings undoubtedly display high prevalence of antibiotic use with and without prescriptions. Irrational use of antibiotics is common among university Medical students and required necessary interventions directed to increase students’ knowledge of antibiotic misused issues. Conclusion: Educational programs should be established to increase awareness of students, the prescribing physicians and the pharmacists of responsible self-medication in general and rational antibiotic use. Self-medication with antibiotics is a kind of indiscriminate use of antibiotics . It’s a common practice among university Medical students worldwide . Responsible self-medication is encouraged by World Health Organization (WHO) as it helps in the averting and treating a minor illness . However, the irrationality of antibiotics use for self-medication has been reported in several developing and developed countries . Many studies reported high occurrence of self-medication with antibiotics among medical and non-medical students . The misuse of antibiotics is danger to both individuals and the community as it is the cause for development of resistant strain of bacteria . Among the many aspects that contribute to misuse of antibiotics is lack of access to healthcare, extensive dispensing by pharmacists of antibiotics without a prescription, lack of regulatory control and prolonged delays to medical care in hospitals . Antibiotics self-medication has become a substantial public health difficult due to a steady raises in financial and cultural reasons . In Libya, evidence about self-medication with antibiotics among undergraduate medical students are inadequate. A high rate of self-medication with antibiotics in Libya was reported previously and a likely link to respiratory tract infections [9,10]. Therefore, the present study is conducted to explore the prevalence of self-medication with antibiotics among undergraduate medical students of Tripoli University, Tripoli, Libya. A prospective cross-sectional survey was conducted during March to July 2018, and was approved by the research committee of faculty of Medical technology, Tripoli University, Libya. Data was collected using a pretested self-administered questionnaire with both open and closed ended questions. The questionnaire was written in English (Translated verbally to the local language) and was pre-validated on a sample of 5 students and comments were taken into consideration. A total of 305 questionnaires were randomly distributed to students of faculty of pharmacy (163 questioners) and faculty of Medical technology (142 questioners), Tripoli University, Libya. The questionnaire contained three open and closed questions that was clarified to all students participated in this study. The first section documented the socio-demographic aspect of students such as age, gender, and year of study. The second section consisted of eight closed questions to deliver facts on the exercise of using antibiotics. The third section consisted of four questions intended to assess the perception of respondents toward antibiotics. A high level of confidentiality was kept throughout the study with written informed consent obtained prior data collection. Students were asked to report antibiotic use with or without prescription in the year 2017. The data entry and analyses were done in SPSS version 22 (SPSS, Inc., Chicago, IL, USA). The data were summarized as percentages and frequencies. Of 305 surveyed students participated in this study, a total of 257 forms were completed and returned (response rate 84.2%). The majority of students (243, 94.5%) were females and the average age was 24.8 years (range 18-25) (Table 1). As shown in Table 2, the prevalence of antibiotic use with and without a prescription was high. Antibiotics were obtained with a medical prescription by 60 (23.3%) and used for self-medication without prescription by 197 (76.6%) of students. The course of antibiotic was completed by the larger number of respondents with or without prescription ([41, 68.3%], [115, 58.3%] respectively). Categories of antibiotics and basis for their use are revealed in (Table 3). The most frequently used antibiotics with or without a prescription were co-amoxiclav, amoxicillin, and cefixime. The most commonly prescribed antibiotics were co-amoxiclav (32, 53.3%), amoxicillin (10, 16.6%), and cefixime (11, 18.3%). For self-medication contributors, the order was the same, the frequently used antibiotics were co-amoxiclav (123, 62.4%), amoxicillin (51, 25.8%) and cefixime (13, 6.6%). The pharmacy was the main source where the majority obtained antibiotics (85% with prescription, 91.8% without prescription). Unexpectedly, large numbers of both groups of students were aware of bacterial resistance associated with misuse of antibiotics. Antibiotics were used with or without a prescription for influenza, upper respiratory tract infection, gastrointestinal disorders, skin conditions and urinary tract infection (Figure 1). Basis for using antibiotics without a prescription include doctor advice on last visit (36.5%), previous experience (27.9%), pharmacist advice (23.3%), and advice of relative (12.1%). Occurrence of self-medication among Medical university student has remained common in both developing and developed countries, especially among young adults [11,12]. Besides the benefits of such practice e.g. economic and save time, its harmful consequences including drug misuse, side effects, drug interaction and abuse. 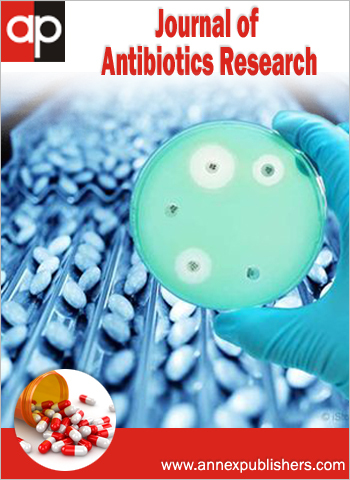 Moreover, the emergence of bacterial resistance with antibiotics self-medication is a crucial problem globally . In this study, we have assessed the prevalence of antibiotics self-medication among medical students in Tripoli University of Libya. This is the first study done with the aim examining the antibiotic usage among Pharmacy and Medical technology students in our university. Nevertheless, a high use of antibiotic self-medication was previously reported in the country [9,10]. Our finding in the present study reported 76.6% of respondents used antibiotics for self-medication. This is quite difference to the use of prescribed antibiotics (23.3%). The prevalence of self-medication with antibiotics among student in the present study is comparable to that reported by previous studies [14-16]. Social and economic factors including lifestyle, immediate available drugs, consultation cost, time consuming in clinics, and lack of nearby healthcare clinics are some of the leading causes for self-medication among population [17,18]. The reported results were very alarming especially in the light of the high awareness of respondents of bacterial resistance associated with misuse of antibiotics (91.7%). This highlights the prompt necessity for educational strategies to be further expanded which would enable students to get better knowledge on antibiotics . A study conducted in Egypt showed the prevalence of self-medication among university students was 62.9%. Younger age, female, medical, and those having home pharmacy students were more practice self-medication than their peers with significant difference between them. They concluded that suitable counselling and public health education would be successful interventions . A study by Nunez et al. 2017, showed that 65.4% of the questionnaire respondents self-medicated of antibiotics, and this high prevalence could be due to the difficulty of access to health care centres and poor income levels to access private physicians . Pharmacy students showed good and moderate knowledge of regarding the antibiotics, but half of them use antibiotics by self-decision and stated that they will not serve the antibiotics without medical prescription . An Indian study demonstrated that pharmacy students had used antibiotic with self-medication, indicating the development of antibiotic resistance due to either medication non-adherence or inconsistent antibiotic usage . Our results also reported that the most frequently self-medicated drugs by Medical students were Co-amoxiclav by 62.4%, and amoxicillin by 25.8%, which is also consistent with other published studies [2,20,21]. This may be because it is the most used and prescribed antibiotics by doctors globally. Moreover, 41.6% of students who used antibiotics by self-decision admitted not completing the course of treatment. Similarly, the course of antibiotics that prescribed by physicians was not completed by nearly 32.8% of students. It is also in the present study, whether antibiotics prescribed or self-medicated, were basically taken to treat influenza and respiratory tract infection which are known to be insensitive to antibiotics as they are mostly caused by viral infection. The practice of antibiotic prescription by only physician does not exclude a possibility that they can be used for self-medication. Antibiotics can be dispensed from pharmacies without prescription, or can be supplied by relatives or friends. Some patients urged physicians to write a prescription of antibiotics for them. For instance, previous study reported pressure from parents on paediatrician to prescribe antibiotics for their children in believing of the efficacy of antibiotics treatment . Being that our study showed high rate of self-medication of antibiotics among our university students. Respondents could also have poor knowledge about what an antibiotic is, although this may be a minor issue, especially among our students, as they were all university students. For these reasons, it is indecisive whether our results are generalizable to other universities in Libya. It is also important to focus the efforts of health authorities and the academic staff on interventions to raise public knowledge of such essential health issues. This study revealed important findings, a high incidence of self-medication practice among undergraduate Medical students which constitutes a health problem related to inadequate public knowledge of antibiotics. Influenza, upper respiratory tract infection, gastrointestinal disorders, skin conditions and urinary tract infection were the main reasons for self-medication. Previous experience, doctor advice on last visit, pharmacist advice, and opinion of relative were major criterion for selection of antibiotics. Education programs should be developed, targeting specific public groups identified in this study, with lower antibiotic knowledge and higher self-medication risk. Finally, the attention of health care policy makers should be focused on physicians and pharmacists, as the main information providers of rational antibiotic use, as well as on community pharmacies, identified as the main source of non-prescription antibiotics. We are grateful for all the respondents for accepting to participate in this study. 1 Ajibola O, Omisakin O, Eze A, Omoleke S (2018) Self-Medication with Antibiotics, Attitude and Knowledge of Antibiotic Resistance among Community Residents and Undergraduate Students in Northwest Nigeria. Diseases 6: 32. 2 Nunez M, Tresierra-Ayalab M, Gil-Olivares F (2016) Antibiotic self-medication in university students from Trujillo, Peru. Medicina Universitaria 18: 205-9. 3 World Health Organization: Report of the WHO Expert Committee on National Drug Policies 1995. 4 Nepal G, Bhatta S (2018) Self-medication with Antibiotics in WHO Southeast Asian Region: A Systematic Review. Cureus 10: e2428. 5 Gelayee DA (2017) Self-Medication Pattern among Social Science University Students in Northwest Ethiopia. J Pharm 2017: 8680714. 6 Rather I, Kim B, Bajpai V, Park Y (2017) Self-medication and antibiotic resistance: Crisis, current challenges, and prevention. Saudi J Biol Sci 24: 808-12. 7 Alzahrani M, Alhindi T, Almutairi A, Aldajani M, Sami W (2015) Frequency of using non-prescribed medication in Majmaah city , Saudi Arabia — A cross sectional study. J Pak Med Assoc 65: 825-8. 8 Patil SB, Vardhamane SH, Patil BV, Santoshkumar J, Binjawadgi AS, et al. (2014) Self- medication practice and perceptions among undergraduate medical students: A cross-sectional study. J Clin Diagnostic Res 8: 20-3. 9 Scicluna EA, Borg MA, Gür D, Rasslan O, Taher I, et al. (2009) Self-medication with antibiotics in the ambulatory care setting within the Euro-Mediterranean region; results from the ARMed project. J Infect Public Health 2: 189-97. 10 Ghaieth M, Elhag S, Hussien M, Konozy E (2015) Antibiotics self-medication among medical and nonmedical students at two prominent Universities in Benghazi City, Libya. J Pharm Bioallied Sci 7: 109-15. 11 Donmez S, Gungor K, Gov P (2018) Knowledge, Attitude and Practice of Self-Medication with Antibiotics Among Nursing Students. International Journal of Pharmacology 14: 136-43. 12 Shafie M, Eyasu M, Muzeyin K, Worku Y, Martín-Aragón S (2018) Prevalence and determinants of self-medication practice among selected households in Addis Ababa community. PLoS ONE 13: e0194122. 13 Helal RM, Abou-ElWafa HS (2017) Self-Medication in University Students from the City of Mansoura, Egypt. J Environ Public Health 2017: 9145193. 14 Fejza A, Kryeziu Z, Kadrija K, Musa M (2016) Pharmacy students’ knowledge and attitudes about antibiotics in Kosovo. Pharm Pract (Granada) 14: 715. 15 Corrêa da Silva M, Soares M, Muccillo-Baisch A (2012) Self-medication in university students from the city of Rio Grande, Brazil. BMC Public Health 12: 339. 16 Dayani G, Mattos G, Modolon A, Cristina T (2009) Responsible self-medication: review of the process of pharmaceutical attendance. Braz J Pharm Sci 45: 625-33. 17 Gillani AH, Ji W, Hussain W, Imran A, Chang J, et al. (2017) Antibiotic Self-Medication among Non-Medical University Students in Punjab, Pakistan: A Cross-Sectional Survey. Int J Environ Res Public Health 14: E1152. 18 Hanif A, Ashar S, Rabnawaz R, Yasmeen S (2016) Self-Medication of Antibiotics among the Students of Hamdard University, Pakistan. J Public Health Dev Ctries 2: 145-8. 19 Ahmad A, Khan MU, Moorthy J, Jamshed SQ, Patel I (2015) Comparison of knowledge and attitudes about antibiotics and resistance, and antibiotics selfpracticing between Bachelor of Pharmacy and Doctor of Pharmacy students in Southern India. Pharm Pract (Granada) 13: 523. 20 Mohanna M (2010) Self-medication with Antibiotic in Children in Sana’a City. Yemen Oman Med J 25: 41-3. 21 Abasaeed A, Vlcek J, Abuelkhair M, Kubena A (2009) Self-medication with antibiotics by the community of Abu Dhabi Emirate, United Arab Emirates. J Infect Dev Ctries 3: 491-7. 22Li LJ, Wang PS (2005) Self-medication with antibiotics: a possible cause of bacterial resistance. Med Hypotheses 65: 1000-1. Atia A (2018) Utilization of Antibiotic among University Medical Students from Tripoli, Libya. J Antibio Res 2(2): 201.